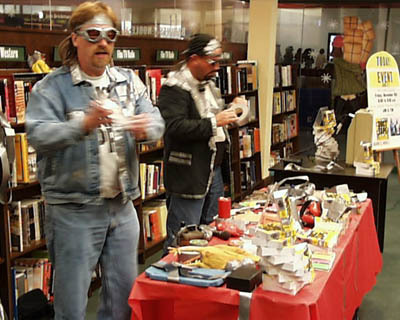 The Duct Tape Guys create a great special event draw for your bookstore! Jim and Tim bring their patented brand of bizarre Duct Tape Standup Comedy right into your store (or your mall) and along with it, tons of happy consumers ready to plop down cash for their best-selling humor books. 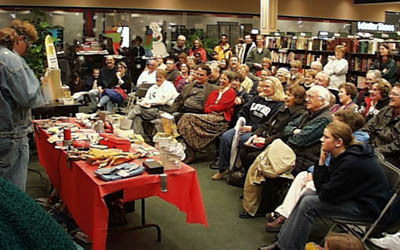 The Duct Tape Guys in-store signings have gathered crowds of over 150 book-buying consumers. Events planned in conjunction with shopping malls draw even larger crowds and post-shop bookstore traffic. The guys are great with the media (radio and television) that brings priceless advertising to your event (and has moved over one million Duct Tape Books and Calendars off store shelves). When booked into your store (or mall) the guys will aggressively pursue media in your town. They both entertain the listening or viewing audience while marketing your event. (Most attendees at bookstore signings attend because theyve heard the guys on the radio or seen them on television.) Click here for our demo video. In a mall? Work with the mall to set up a stage and chairs in the mall commons in proximity to your store. The Duct Tape Guys will perform and direct people to your store for the post-show signing. Or, join forces with a fashion store and hold a Duct Tape Fashion Show. Attendees come dressed in Duct Tape creations and the Duct Tape Guys will emcee the event. Freestanding store? Put up a tent (as weather permits) in the parking lot and have a Duct Tape Comedy Event (or Duct Tape Evangelism Tent Meeting if you prefer). Get a local radio station to cosponsor the event. To book the guys for your event, call Kate Tyler at Workman Publishing (800-722-7202). Click here to go to the Duct Tape Guys refrigerator. Above and Beyond Marketing Efforts We have been amazed at the lengths some stores have gone to market our books. From duct taped arrows on the floor to the table or endcap displaying the books, to duct tape ties and vests on the clerks. On the right you can see that customers in the Barnes and Noble in Roseville, MN, didn't let customers out of their store without noticing The Jumbo Duct Tape Book. #10. Place duct tape, sticky-side-out, on book covers so customers find them hard to put down. #9. Use duct tape to reinforce binding on used books. #8. Use a strip of duct tape to add a touch of class to?otherwise boring new book covers. #7. Duct tape edges of carpet runners and floor mats ?to prevent ugly lawsuits. #6. Duct tape easily binds shoplifters until the police show up. #5.Use duct tape to cover naughty cover art on romance novels. #4. Duct tape arrows on the floor point the way to the checkout  the perfect place to impulse-sell a truckload of The Jumbo Duct Tape Book. #3. Duct Tape the floors in your most popular ?sections to prevent wear and tear on your floor?covering. (A great look for sci-fi sections). #2. Duct tape beverages into your customers hands so they dont spill all over your merchandise. 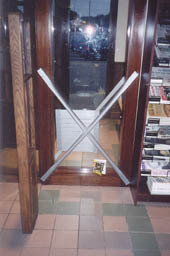 And the #1 bookstore use for duct tape: To post a Yes, We Have The Duct Tape Guys New Book! sign to your front window.